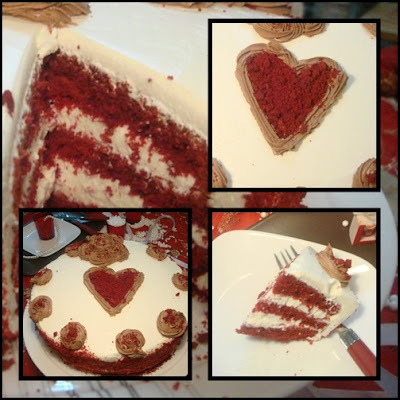 Most of the people love the tramendous flavour of Red Velvet Cake and some people don't, well the botton line is I just love baking and love Red Velvet Cake and I love to bake it but a few months ago I discovered a one newer version and i.e. 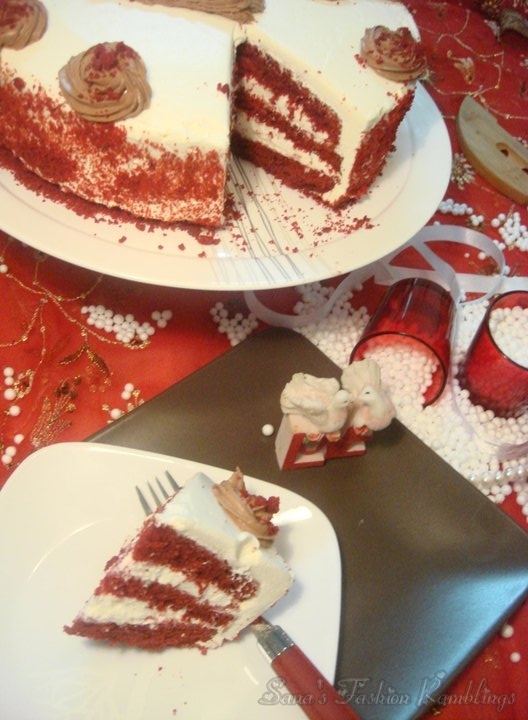 Red Velvet Cheese Cake which is equally mouth watering and deliciously to die for. 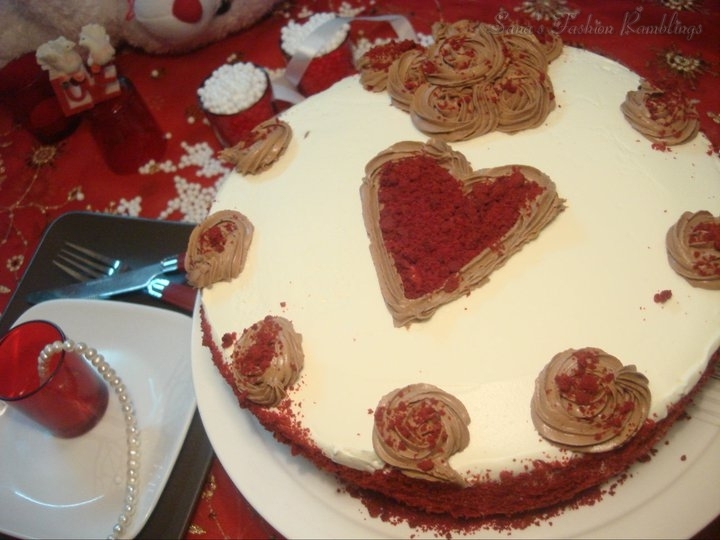 A red velvet cake is a cake with a dark red, bright red or red brown color. It is usually prepared as a layer cake with either a vanilla or chocolate flavor with a creamy white icing or a cookie dough fiiling. 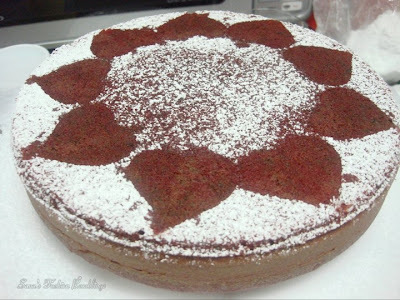 The reddish brown color of the cake originally was from a reaction of the cocoa powder with an acidic ingredient such as buttermilk, however red food coloring is often added especially if the cake does not contain chocolate. Common ingrdeints are buttermilk, butter, flour, cocoa, cookie dough and beetroot or red food coloring. The amount of cocoa used varies in different recipes. Cream cheese frosting is most commonly paired with the cake as well as the traditional buttercream. Super Moist Red Velvet Cake With Cream Cheese Frosting. Preheat oven to 350F and place rack in center of oven. Butter two 9'' round cake pans and line them with parchment paper. Set aside. In mixing bowl sift togather the flour, salt and cocao powder, set aside. In seprate bowl beat the butter until soft, add the sugar and beat until light and fluffy. Add the eggs one at a time, beating well after each addition. Scrape down the sides of the bowl. Add vanilla extract and beat until combined. In a measuring cup whisk the butter milk with the red food coloring. With the mixer on low speed, alternately add the flour mixture to the butter mixture, in three addition, beginning and end with the flour. In seprate small cup combined vinegar and baking soda. Allow the mixture to fizz and then quickly fold into the cake better. Work quickly, divide the batter evenly between the two prepared pans and smooth tops with an offset spatula or the back of the spoon. Bake in the pre-heated oven for about 20-30mins or until a toothpick inserted comes out clea. Cool the cale in their pans then on a wire rack for 10 mins. In clean and dry bowl beat cream cheese and mascarpone cheese until smooth. Add the vanilla and icing sugar and beat until smooth. Using the whisk, gradually add the heacy cream and whip until frosting is thick enough to spread. Add more sugar or cream as needed to get right cosistency. 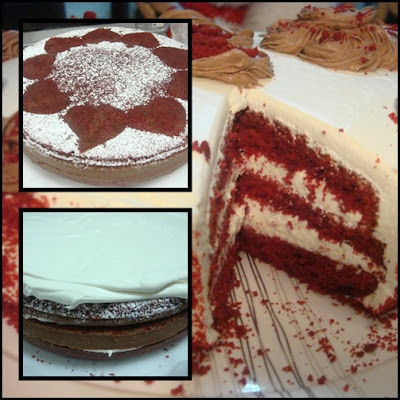 With a serrated knife, cut each cake layer in half horizontally. You'll have four cake layers now, place one of the cake layers and top of the cake should facing down on your serving platter. Spread the cake layer with a layer of frosting. 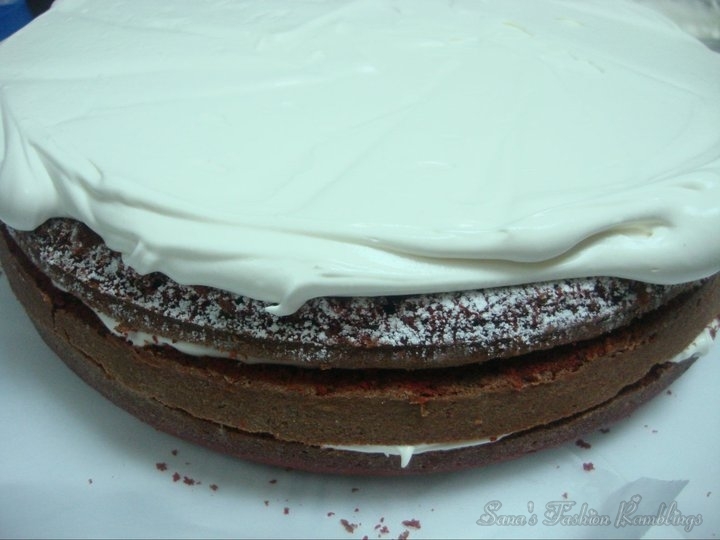 Place another layer of cake on top of the frosting and continue to frost and stack the layers. You can garnish cake with sweetened or unsweetened coconut. This is all for now dolls, hope you like it. Do share your feedbacks in comments below. What do you think about it ? Anyone of you tried it yet? 30 comments on "Red Velvet Cake [Happy Valentine's Day]"
Oh!!! I want!! Thanks for sharing - will give it a go! I love red velvet, looks delicious! Hiya. Thank you for your visit on my Blog. I'm glad you liked my Working out post. 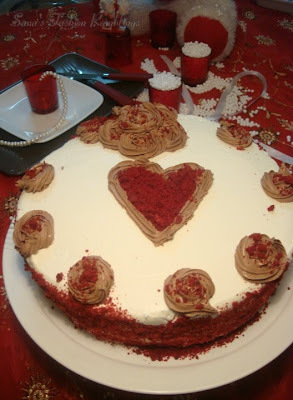 Now I'm not a big fan of Valentine's Days but that cake looks deliiissshhh :P.
that sounds sooo gooood!! :) would you believe me if i said i had never had red velvet ? i found you in the GIG fb group and am FOLLOWING NOW :) Hope you can follow me back! THanks! WOW is all I can say! Oops n I WANt some! Hi! Thanks for visit and comment my blog. 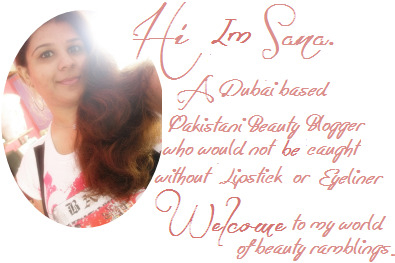 I'm glad you follow me and likes my blog. Ahh these look sooo good! I have to try it! Oh this cake seems to be delicious ! Love the 2 colors in it ! Hope you have a lovely day this special day ! ¡¡Hola Sana¡¡ Muchas gracias por pasarte por mi blog y hacerte seguidora. He estado visitando tu blog y me ha gustado muchísimo. Te sigo . REѴΙEW BELLA NAIL DESIGN CHEAP SHΙT COUNTERFIT BRAND !!!! STAY AWAY FRՕM THIS FAKE !! Alsso νisit my web site :: Review of Bella Nail Design. Does not last. Chips in first day. Burnt my skin badly.